Ok. My friend Dave on google plus does plenty of this and he has inspired me to try it. This is the first time I picked up knitting needles in a long time. I was impressed I could cast on and remember knit and purl. 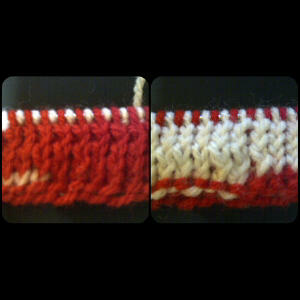 I haven’t started any form of pattern so really this was supposed to be red one side white the other. This entry was posted by Liz on Monday, October 1st, 2012 at 10:31 pm	and is filed under Plans. You can follow any responses to this entry through the RSS 2.0 feed. You can leave a response, or trackback from your own site.